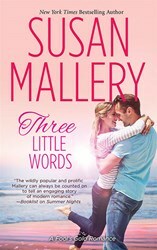 At a time when book buyers rely on online reviews more than ever before, Three Little Words by bestselling author Susan Mallery has received more than700 customer reviews on Amazon – with an average of 4.8 out of 5 stars. The romance novel, available in mass market paperback, ebook, and audiobook, has also received almost 500 customer reviews on BarnesandNoble.com (4.5/5 stars) and over 1,100 ratings on Goodreads.com (4.07/5 stars). Mallery is known for writing laugh-out-loud love stories with characters who ring true to life. Three Little Words is the third book of Mallery’s summer trilogy of small-town romances set in Fool’s Gold, a quirky, small town in the foothills of California’s Sierra Nevada mountains. The final book in the trilogy has received a greater number of reviews than the first two, but not by much. Just One Kiss has received nearly 600 Amazon reviews, with an average of 4.7 out of 5 stars, and Two of a Kind’s 646 reviews average 4.8 out of 5 stars. Amazon editors have taken notice of Mallery’s books, as well. Both Three Little Words and Two of a Kind were honored as Best Books of the Month by the popular book-selling website. Mallery is known for writing laugh-out-loud love stories with characters who ring true to life. Three Little Words is about Ford Hendrix, a hometown hero who returns to open a bodyguard training facility, only to discover that his matchmaking mother is a more determined adversary than any enemy he faced while in the Navy SEALS. His ally in the fight to stay single is Isabel Beebe, who agrees to play the role of his girlfriend on her temporary stay in town to sell her parents’ wedding boutique. Soon enough, their faked feelings become all too real. Mallery’s next book, Christmas on 4th Street, a Fool’s Gold romance novel, will be released on September 24 in hardcover, ebook, and audiobook. A free excerpt is available at http://www.SusanMallery.com.